The VIX spiked in early trading (+10% to 13.41), but quickly failed as equities merely churned. 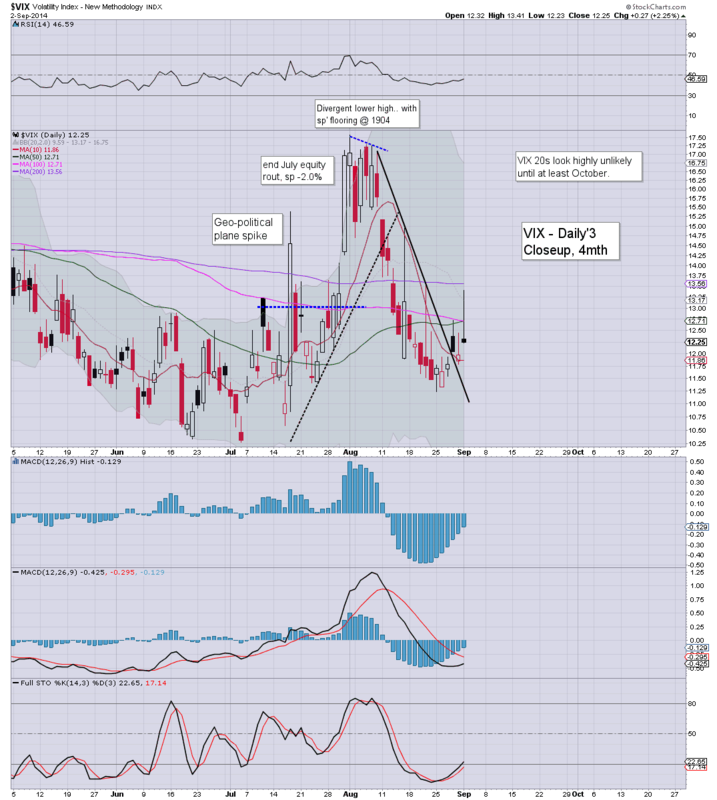 The VIX settled moderately higher, +2.2% @ 12.25. Near term outlook is for VIX to remain within the 13/10 zone. VIX remains low, and the big 20 threshold looks unlikely to be hit for at least another 5-6 weeks. Equity bears should keep in mind, that if the next multi-week equity down cycle does not break much below sp'1960, then VIX will not be breaking >20 until next year. US indexes closed moderately mixed, sp -1pt @ 2002 (new historic high 2006). The two leaders - Trans/R2K, settled higher by 1.3% and 0.4% respectively. Near term outlook remains bullish, with the 2030s viable by end of this week. Overall, a day of minor chop. However, the bulls achieved two new historic highs... sp'2006, and Transports 8519. Both are indicative of the broader upward trend. US equities look set to close a little weak, but having broken new historic highs of sp'2006, and Trans' 8519. Commodities remain somewhat battered - via a rising USD (+0.3%), Gold -$21, Oil is lower by a rather severe -3.0%. So.. a rather quiet day to start the week. No doubt its going to take a week or two for most to have returned from late summer vacations. Even then...volume will no doubt remain light. The only time we get decent vol' is on down days...as ever. As for today... the problem for the equity bears remains the same...new highs are regularly being broken. 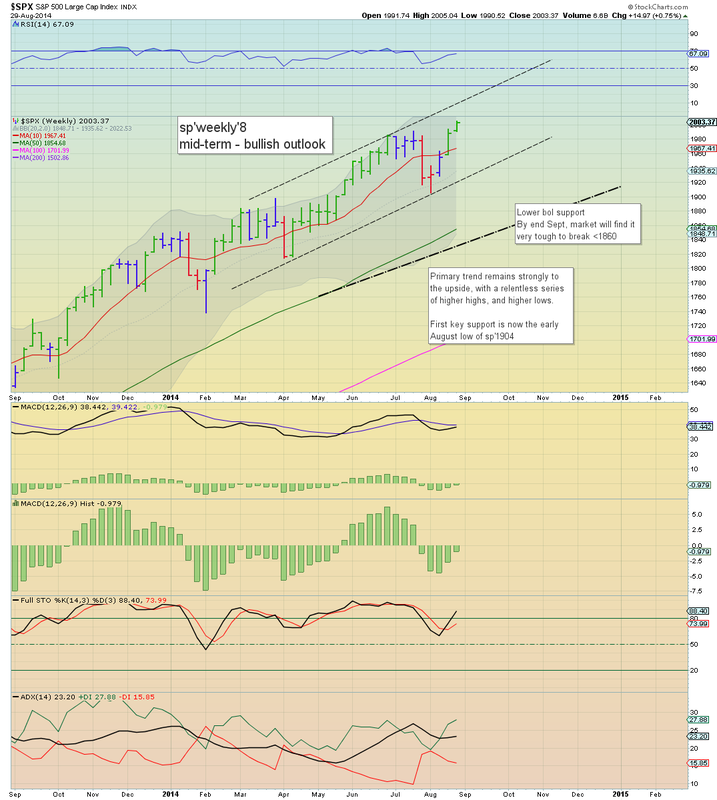 With the upper bollinger on the giant monthly cycle now in the sp'2070s, there will no doubt be increasing talk of the 2100s by end year. Lower oil prices... in the 90/80s.. really is quite a bullish thing for the broader economy. ps..not that I'm saying '90/80's are 'cheap'.... but its a hell of a lot better than 100/110. Whilst equities continue to see minor weakness, there is some real carnage in commodity land, as the USD continues to climb. Gold is -$22, with Silver -1.8%. Oil is lower by a rather severe 2.9%, with Nat Gas' -4.0%. Suffice to say... a rising dollar will be a constant pressure on all US $ denominated asset classes...and that does of course included equities - although the effect is far less. 2.32pm... chop chop... but we're creeping a little back upward sp'1999. 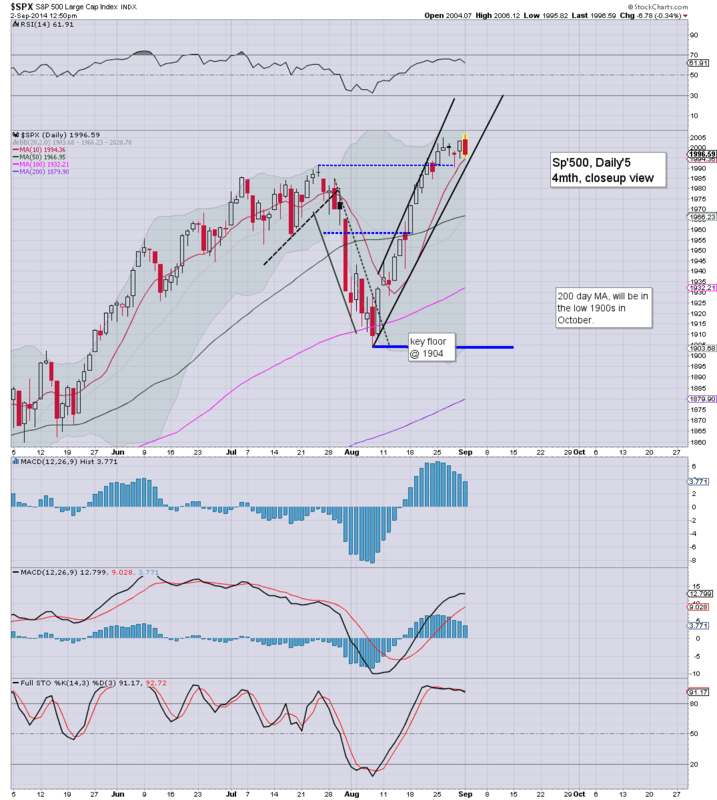 A touch of weakness, but with new historic highs in the sp'500/Transports, it is another day for the bulls. Yet... the equity bears are still at it... still looking for minor down cycles within the broader and powerful upward trend. Pointless.... utterly .... pointless. 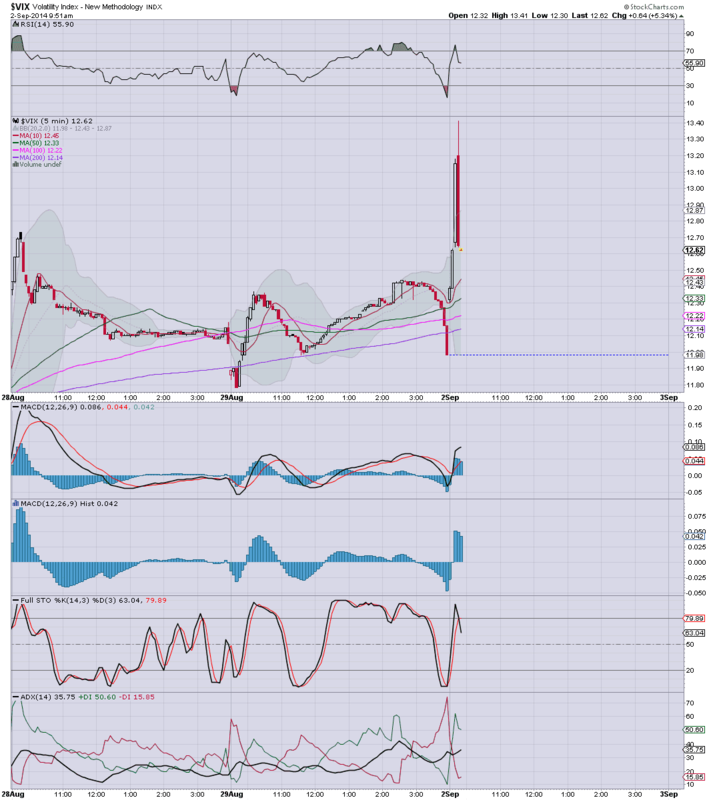 *notable weakness in Oil, -2.7%, and this is probably why airlines are doing well. DAL +2.5%, UAL +3.2%. First support, daily 10MA @ 1994...should hold. Whilst we do have econ-data across the week, Thursday will be the major day, with the market looking for some kind of QE from the ECB. This expectation is most certainly being reflected in the Euro/dollar pair, having slipped to 1.31. I'd agree with Riley, and look for late day strength. 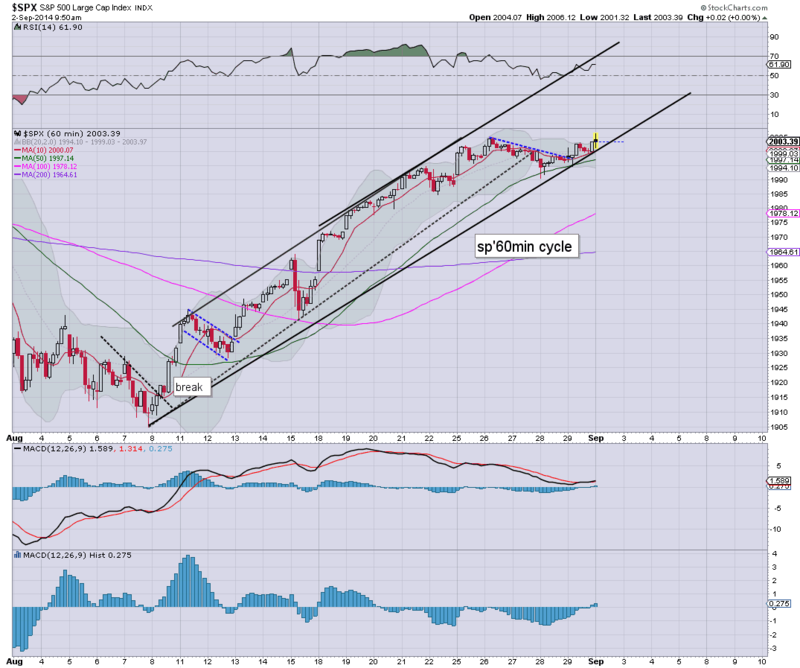 US indexes continue to see minor chop, although there are notable new historic highs for the sp'500 and Transports. Metals/Oil remain significantly lower, as the USD (still King) continues a multi-month climb. Whilst many continue to call for a dip, retrace..or 'grand wave lower'...the market continues -as a whole, to grind higher, not least reflected in the two leaders - Trans/R2K. Upper weekly bollinger is now 2027...and will probably be around 2030 by Thur/Friday. For now..that is the upside target.. whether this week or next... makes no difference. US equities have seen some minor mixed chop, but price action is the same... with underlying upward pressure - as reflected in new historic highs in the sp'500 and Transports. Metals/Oil remain very weak, with the USD on the climb. *there is notable weakness in commodities, as the US dollar continues what appears to be a very important multi-month climb. So, we've now two new index highs, and its not even lunch time! 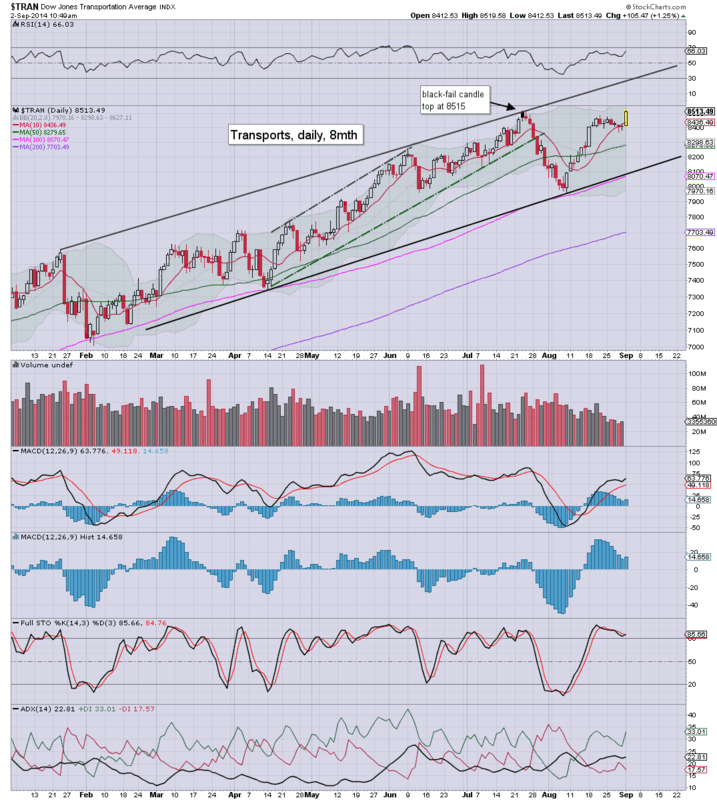 Price structure on the Transports was a two week bull flag... and that has been confirmed with the new high. 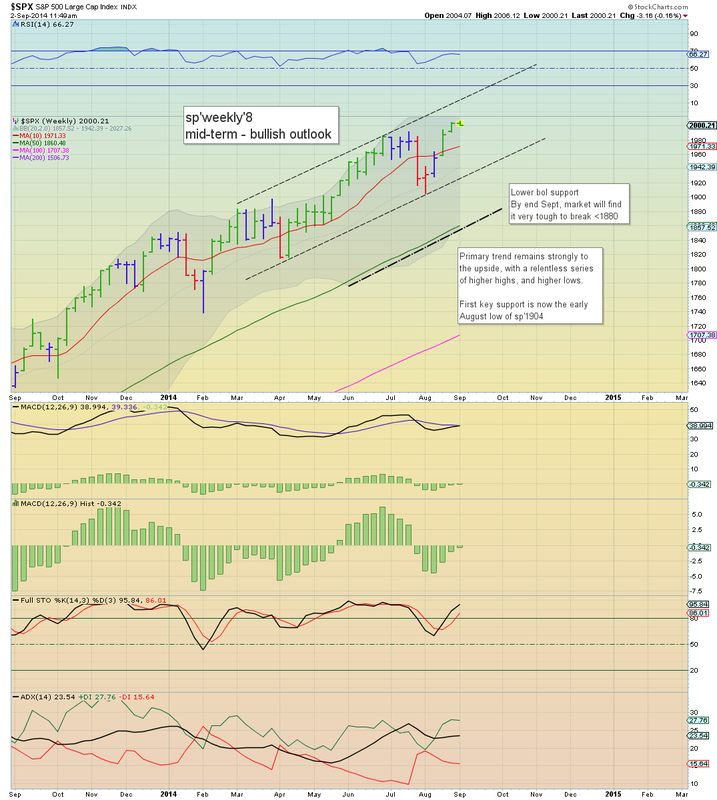 Upper weekly bollinger will be offering sp'2030s by Thur/Friday...a mere 1.3% higher.. very viable. *a notable early gain in the VIX of around 10%...back into the low teens... but it has already failed...as seen on the 5min micro cycle. I realise some are still seeking the 1980s... which would equate to VIX 15s (where there is an obvious gap zone)..but overall...there is little reason why we'll see a 2-3 day down cycle this week. *I remain long via SDRL, that opened higher, but is now a touch red ...the lower oil prices are not helping the energy sector. 10.40am.. There is just no downside power..and we're almost right back into algo-bot melt mode. Good morning. Futures are a touch higher, sp +1pt, we're set to open at 2004. Precious metals are beginning the last third of the year sharply lower, Gold -$15, with Silver -1.3%. USD is naturally stronger, +0.3%. Welcome to a new month.. indeed, we're now two thirds of the year complete. So, we're set to open a little higher. . the 2020s look a relatively easy target by Thursday. One thing I will watching this morning is how high (or not) the upper bollingers jump for the bigger weekly/monthly cycles. I think it is kinda important since it offers an effective ceiling on the month ahead. 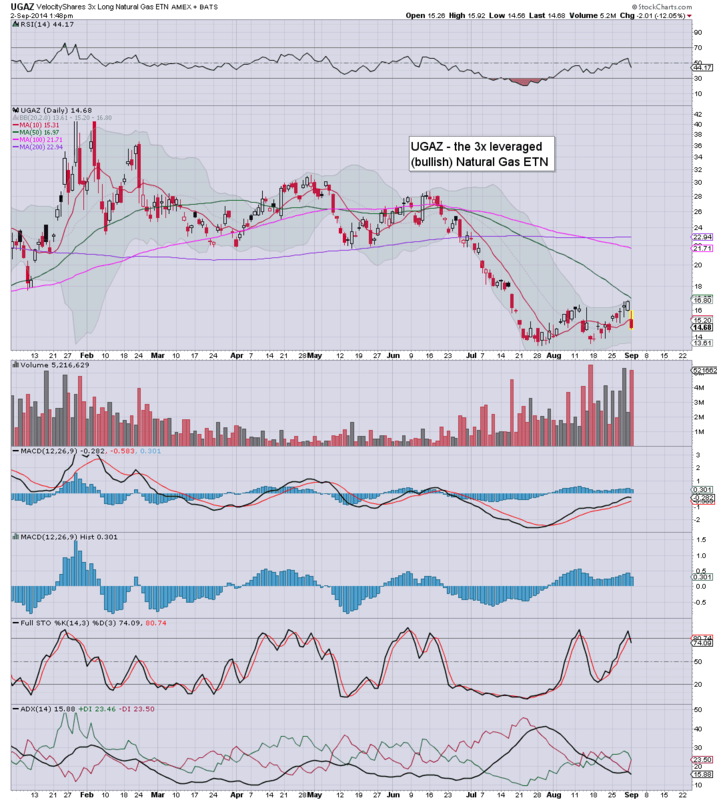 I should note, I fully agree with Oscar on the Gold, which looks set to take out the 2013 lows at some point. 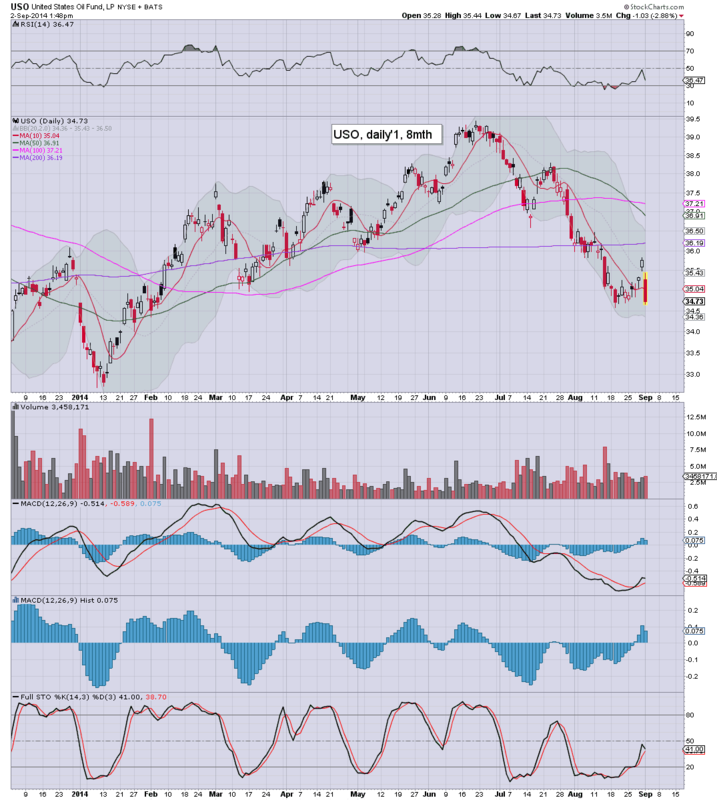 That has rather grave implications for the mining stocks, inc' the ETF of GDX.